Under the ownership of former investment banker Lynn Tilton, a once-shuttered pulp mill in Old Town, Maine, is shooting to commercially produce aviation fuel from wood. A New York City-basedfinancier wants to make aviation fuel from wood using extracts from wood chips typically used in the pulp and paper process—and she is moving ahead aggressively to reach that goal. Lynn Tilton's pulp mill in Old Town, Maine, has a plan to begin commercially producing bio-butanol within two years, some of which would be used as fuel for helicopters the savvy former investment banker owns. Should the plan succeed, the Old Town pulp mill would be the first integrated facility in the world capable of producing both pulp and bio-butanol. Penobscot River. The operation began as a sawmill in 1860, evolved into a pulp and tissue mill, and is now being transformed into a pulp and bio-fuels plant on the leading edge of society's transition from a fossil-fuel based economy to a society that is more and more embracing renewable alternative fuels. The company is working closely with the University of Maine to investigate and implement the technology needed to build a commercial bio-butanol production plant. Bio-butanol is related to ethanol but is less corrosive on pipelines, easier to mix with gasoline, and has about 30 percent higher energy content. One knock against ethanol derived from feedstockssuch as corn is its corrosive impact on pipelines. Business turnaround specialist Lynn Tilton rescued the pulp mill from bankruptcy in 2008 through her company, Patriarch Partners, and made a $40 million investment in the mill. The company has a history of investing in troubled businesses, and the pulp mill in Old Town certainly qualified. For many years, Georgia-Pacific manufactured pulp in the mill under the Northern Tissue brand of products but decided to close the mill in 2006, putting about 460 employees out of work. Not long after, a company called Red Shield bought the pulp mill and partnered with the University of Maine in a Forest BioproductsResearch Initiative. A joint proposal to the United States Department of Energy yielded a $30 million grant to work with the university on a pilot ethanol production plant. However, Red Shield ended up filing for bankruptcy in 2008, and that's when Patriarch Partners stepped in to operate the pulp mill as Old Town Fuel and Fiber. New owner Tilton managed to get agreement from the local union for pay cuts in exchange for steady jobs over the short term to ensure the pulp mill could operate. Within six months, pulp prices and productivity gains allowed wages to return to previous levels, and now she has her eye on another prize on the horizon—bio-based aviation fuel. In addition to producing 600 tons of pulp per day, Tilton has directed mill management to investigate the technology and build a bio-fuels production plant at the pulp mill. It would initially produce about 1.5 million gallons of bio-butanol from extract removed from 80 bone dry tons of wood per day. The plant is expected to cost about $75 million, financed through a combination of company and U.S. federal government funding. The federal government has already committed $30 million toward the project, which must be matched by the company. Tilton is banking heavily on the federal government aggressively pursuing its goal of domestic companies producing 21 billion gallons of bio-fuels by 2022, and also that legislators will require fuel producers to include a percentage of bio-based fuel in their conventional fossil fuel formulations. 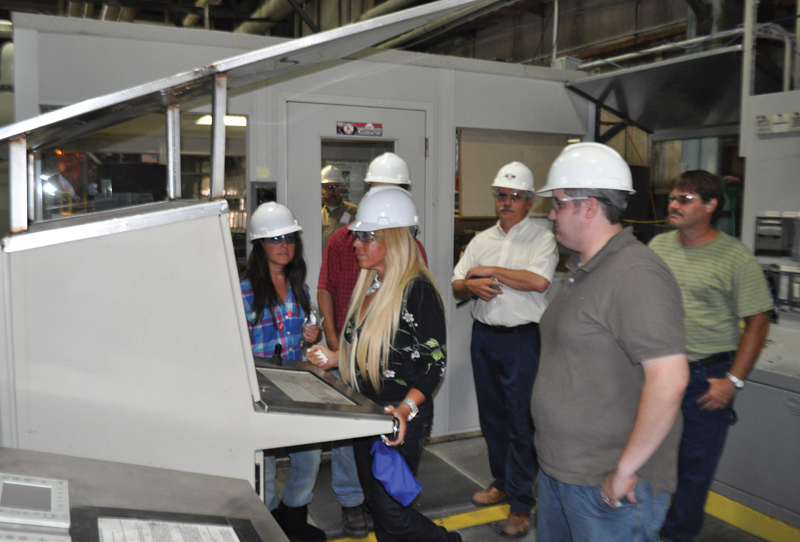 The owner of Old Town Fuel and Fibre Lynn Tilton (above, with long blond hair), has directed mill management to investigate the technology and build a bio-fuels production plant at the pulp mill. It would initially produce about 1.5 million gallons of bio-butanol from extract removed from wood. The bio-fuel produced at the pulp mill could also find a market within Tilton's own stable of companies, as she owns MD Helicopters, originally founded by Howard Hughes. So far, the pulp mill has progressed to installing the feedstock extraction process at its front end and has built a bio-fuels production pilot plant. It hopes to have a commercial plant operating in about two years. Jim St. Pierre, the company's bio-refinery project manager, says the existing infrastructure surrounding pulp production makes the company's consideration of a bio-fuels manufacturing facility possible. Integration of both processes is key to its economic viability. "If this was a greenfield plant, there is no way that anyone could afford that kind of investment," he says. "I think it's important to understand that it's not something you can start on day one and say that you are going to build a facility." St. Pierre acknowledged there is still quite a lot of work to do to have the bio-butanol produced at the pulp mill certified by transportation experts at the Environmental Protection Agency (EPA) as an aviation fuel or as an additive to fossil fuel-based aviation fuel or gasoline. Several local companies have been approached about taking the fuel manufactured by the pulp mill, and while they don't anticipate an issue blending the bio-butanol with conventional fuel, they are awaiting approval on the product and its use from regulatory agencies. So far, activity at the pulp mill to produce bio-fuels has not caught the attention of the fossil fuel industry, and St. Pierre thinks that is because they are a small player in the marketplace and still have to prove their process. The northern hardwood chips for manufacturing both pulp and bio-fuels are supplied under contract by other forestry companies located in the surrounding area, and St. Pierre emphasized that the extract must come from hardwood, not softwood. A ‘pre-hydrolysis' process—which has already been constructed and installed before the pulp production process—produces the extract that includes such material as lignin and hemicellulose that will be used in bio-butanol production. "The process is probably commonly known, but not applied," says St. Pierre. "We have developed the technique here to apply it within our process. If you have the right equipment and process knowledge, it certainly is very possible to do it." He says the fact that the pulp mill has actually gone ahead and built an extraction facility is what's very unique about this situation. St. Pierre says the pulp mill's partnership with the university has been invaluable, as they provided the necessary technology and innovation that led to early versions of the company's pre-hydrolysis system. The university has also been able to advise the company on the technical viability of various processes being considered. "They have been a willing and resourceful partner through every turn we have made since the beginning of this process," he says. The pulp mill has in fact hired one of the key researchers from the University of Maine, "because we see this as a long term engagement, not a short term contract." Lynn Tilton at the Old Town Fuel and Fibre mill (at left), talks about the potential markets for bio-fuel. The bio-fuel produced at the pulp mill could find a market within Tilton's own stable of companies, as she owns MD Helicopters, originally founded by Howard Hughes. As to the economic viability of the proposed technology, St. Pierre says it will be up to the company to decide whether to implement it. 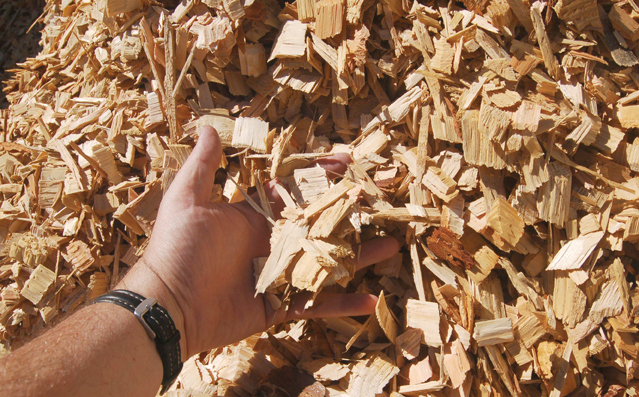 The pre-hydrolysis process will consume about 10 percent of the wood chip feedstock serving the pulp mill. There are 1200 bone dry metric tons of wood chips arriving at the plant every day. To date, the pulp mill has produced up to five percent extract from the wood chips, which so far has been conditioned and processed into sugar at the pilot plant. Researchers have not yet fermented the material at the pilot plant into bio-fuels but are working with other technology companies to better understand what opportunities are available to Old Town Fuel and Fiber from the extract. They plan to have the pilot plant fully integrated into the pulp mill by the end of the year, to be able to manufacture small amounts of bio-butanol on site, which will also allow them to show their product to potential customers. In addition to the building blocks needed to produce bio-butanol, the pre-hydrolysis and fermentation processes will also allow the pulp mill to remove other valuable chemical products such as acetic acid, acetone, and formic acid from the extract. St. Pierre emphasizes that the direction they have been given from Tilton is to focus specifically on manufacturing aviation fuel from wood. Removal of hemicellulose as well as other chemicals such as lignin from the wood fiber has not had a negative impact on pulp quality, although the company has had to modify its bleaching process and witnessed a small percentage of yield loss. The U.S. government has set an aggressive target for domestic bio-fuels production. And it seems that if anyone from the business world is capable of helping them meet that target, it may be the sometimes flamboyant and extremely bright Lynn Tilton. In 2005, Tilton, who has been known to attend trade shows wearing a leopard-skin dress with knee-high boots, purchased MD Helicopters at a significant discount. The company didn't manufacture a single helicopter its first year under Tilton's leadership, but went about moving the manufacturing of parts in-house to quell complaints from unhappy existing customers. By 2008, the company delivered 50 new aircraft. Tilton also bought the floundering Spiegel catalogue business, which was established in 1905, and launched an aggressive plan to market its products on-line. Tilton is a fan of vertical integration, and many products manufactured by other companies she owns are now sold through Spiegel on-line. Launched in 2000, Patriarch Partners is reported to have equity interests in over 70 companies and controlling interest in about two-thirds of those companies. It seems that news of the death of good old Yankee know-how may well have been exaggerated, if Tilton and the Old Town employees are any indication. They are hoping to show that a blend of old and new industry—and a lot of New England initiative—may be the best path forward to expand bio-fuels manufacturing capacity in North America.